Early this summer Coach refreshed its Apple Watch band collection for the summer. It had a number of new styles and new colors to adorn your wrists as you hit the beach. And now it's dropping one more as we make our way through the middle of summer. First spotted by Haute Criture, the new strap is the Apple Watch with Charms, which is actually a refreshed version of an old strap. 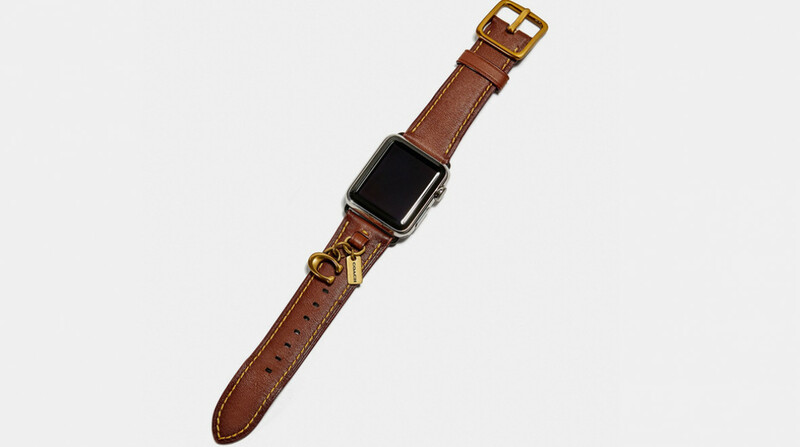 That old strap came in Saddle brown and sported silver charms; the new one is a khaki leather brown with gold charms. The khaki is also a darker brown than the saddle one. The charms include a Coach "C" and a little dogtag with "Coach" emblazoned on it. Coach is also discounting some older bands by significant amounts. Select colors of the Apple Watch Strap with Tea Rose are down to $87.50 from $175 while select colors for Apple Watch Strap with Prints are down to $75 from $150. Finally, the chalk edition of the Apple Watch Strap with Charms is also down to $75 from $150. The new Charms strap is only available for 38mm Apple Watches for $150.